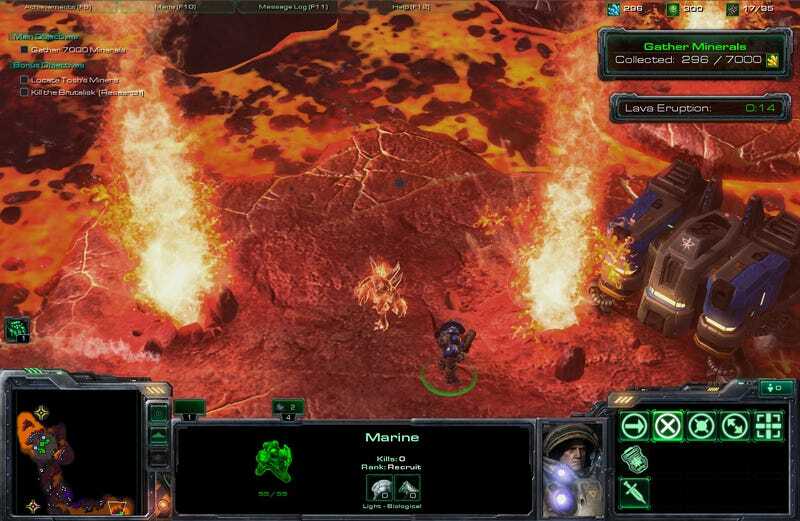 StarCraft II: Wings of Liberty's lava-filled planet of Redstone III has a hidden secret, a guest appearance from another Blizzard-created game. Nestled at the far edge of the map is the Lord of Terror, Diablo, stranded on an island and surrounded by molten lava. (So that's why they call it the Devil's Playground...) He's unclickable, meaning that you can't sic your Terran forces on the antagonist of Blizzard's role-playing game series, but he's certainly not immune to Redstone III's rising pools of lava. Click the above image to Diablo-size or watch his unholiness in action below. Or, hell, float your Barracks over to the bottom right corner and face down the evil one himself. Thanks for the tip, Adrian!